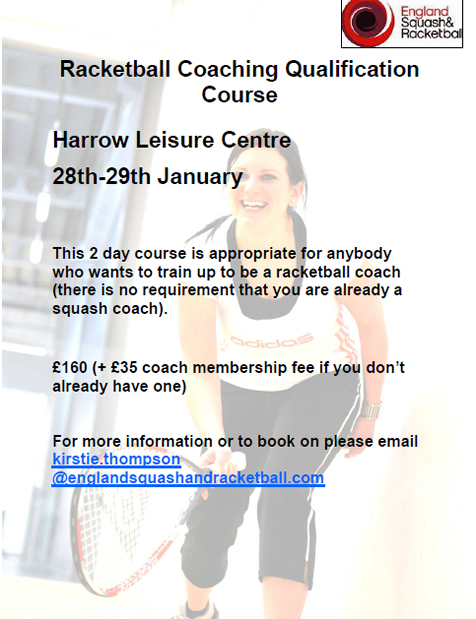 If you know anyone who might want to become a racketball coach, please let them know that we will be running a 2 day coaching course on 28th-29th January. This is the two day course and so needs no prior coaching qualifications. It is £160 (+£35 coach membership if you don't have one). The timings will probably be 10am-4pm each day. The venue is yet to be confirmed but will be in North London. I will let you know the venue in January; but if possible we would like to gather interest before then. After the course you will be qualified to coach both group and individual racketball lessons.